PRESS RELEASE: The ToeKicker is a stompbox that has been crafted from hand selected wood. 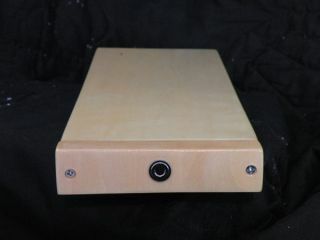 Unlike many other acoustic stompboxes available, the ToeKicker is not constructed from a solid piece of lumber. Rather, it is built more like a drum with a powerful electronic pickup mounted inside (It measures approximately 16" x 1.5" x 6"). Tapping the surface with your foot causes the pick-up to produce a variety of percussive sounds depending on where you tap it, including a deep kick drum sound at the sweet spot! It is compact making it easy to transport. It is designed for acoustic or electric guitarists, bass players and hand drum percussionists. The ToeKicker simply plugs into a P.A. or amplifier using a standard quarter inch jack. Plugging into a P.A. may require a pre-amp and/or a DI box. And last but not least, the ToeKicker is backed by our 1-year limited warranty! We guarantee the components and construction to be free from defect or we will repair or replace it free of charge! Approximately 16" x 1.5" x 6"
Available August 2009, the ToeKicker by Kopf Percussion.